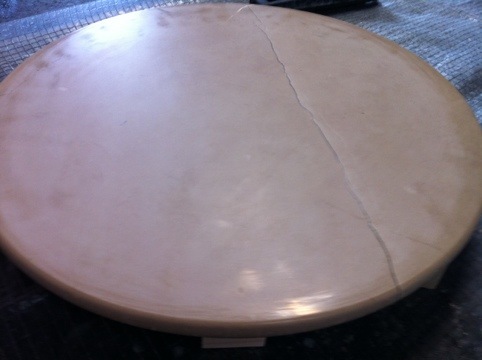 Marble, limestone and travertine tables can often look tired and become scratched and dull for a number of reasons. Often drink spills, incorrect cleaning products and general wear and tear can leave the tables with a very patchy appearance. 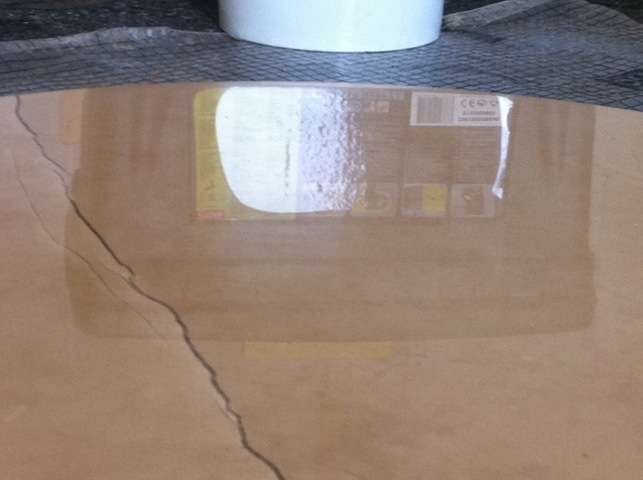 Wine, champagne, coffee and many other liquids can cause ring marks and dull spots on natural stone tables, work tops and vanity units. Polished marble, limestone and travertine tables are sensitive to these drinks and when spilt directly onto the table and left to soak in, a dull spot can be left and make the table look very patchy. Also many general cleaning project like, Flash, Cilli Bang and Mr Muscle all contain harsh chemical with can cause etch mark or dull spots in tables, work tops and vanity units. Even thou these chemicals do state they can be used on natural stone, this does not always ring true. These products would not cause a visible problem to a dull honed marble table top or something like a slate work top, but polished marble, travertine and limestone tops are very unforgiving and shows up all the marks and imperfections. This is also true for scratches caused by general wear and tear. Often works tops scratch easily when plates, cooking appliance, and knifes are dropped or dragged around. Also, one table we saw, was wrecked in one corner, from were the customer would use their laptop and from placing it down on the table, day after day, had caused the shine to dull down completely. The table in the below picture used to have a wonderful high polished finish, but the use of the incorrect cleaning product, dulled it down over time. There were also some small scratches in this table, so diamond abrasive pads were used to remove the scratches and refinish the stone. This works by smoothing out the stone, and cutting back enough of the stone, to remove all the damage. Once all the damage is removed, you can then work back up the grits to bring the shine back. Many people use a combination of diamond abrasives and polishing powders and crystslizers to create a polished finish. To restore this table we used a completely natural system called The Cheetah Pads. We recommend that you definitely check these out. Using only water, the results below were achieved. 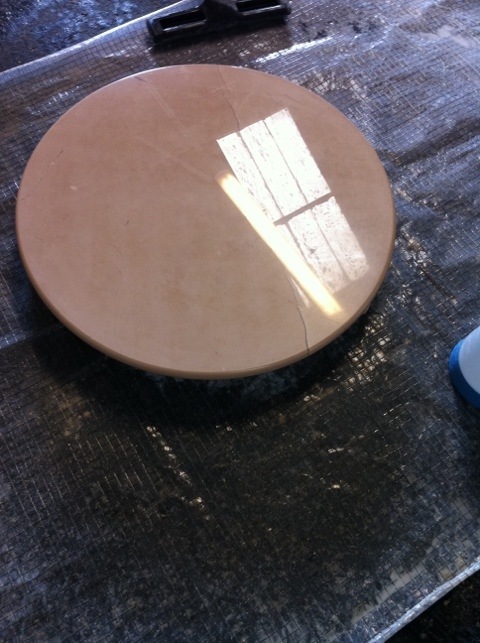 One other thing i would like to mention about the Cheetah Pads, is the speed in which we managed to restore this table. To get from the dull finish to the mirror finish only took 7 minutes. If you would like any further information on the Cheetah Pads, dont hesitate to contact myself on 07884472149 or email me at martin@imperialfloorcare.co.uk, or contact the uk distributor at Alltec. Checking them out is a must. So if you are having problems with your work tops, vanity units or table tops, whether it be, marble, limestone or travertine, contact your local stone restorer. Or feel free to contact Imperial Floor Care and we can advise you on the best way to get your natural stone back to the wonderful high polish that you desire. This entry was posted in acid marks in marble, bathroom tiles, cheetah pads, diamon grit pads, drinks marks on tables and ring marks, dull spots in limestone tables, dull spots in marble tables, dull spots in travertine tables, how to clean my bathroom tiles, how to get a red wine stain off limestone tiles, how to make marble shine, how to polish, how to polish limestone tables, how to polish marble tables, how to polish travertine tables, how to remove dull spots and scratches from limestone tables, how to remove dull spots and scratches in travertine, limestone, marble etch mark, marble hand pads, Marble Polishing, marble scratch repair, polishing, polishing linestone, removing dull spots and scratches from marble table, removing dull spots from marble, Stone Restoration, table tops, Travertine, travertine polishing, twister pads, vanity units polishing and tagged cheetah pads, diamond, drink stains on table, grind, honing, how, limestone, make, Marble, marks, polishing, red wine, removal, remove, repolish, restore, ring, scratches, shiny, stain, table tops, tables, to, Travertine, twister pads, vanity units, work tops. Bookmark the permalink.